Green tea is a favorite hot beverage among health enthusiasts around the world. Its proven health benefits include antioxidant protection, anticancer properties, improved metabolism, antimicrobial action, promotion of weight loss and increased alertness as well as several other quite impressive properties. Nevertheless, drinking too much green tea can have its downside as the beloved infusion can negatively affect one’s health by driving certain health effects to the extreme. For instance, while it is great it increases alertness, green tea drank in great amounts can cause insomnia, restlessness, agitation. In more sensitive people, green tea may produce side effects such as arrhythmia, palpitations, extrasystoles etc. The same goes for other types of herbal infusion from Camellia sinensis leaves, namely white and black tea, yellow tea, kukicha (made from twigs), etc. When it comes to eating certain foods or drinking certain beverages, we must keep in mind that we are not all the same and that our bodies have different nutritional requirements. While some of us could use a good cup of green tea to perk us up, others might feel the infusion is too much because it makes us agitated or irritated. Some people have to avoid stimulants such as coffee, soda drinks, black or green tea because they might have irregular heartbeat or arrhythmia. Pregnant women have to consider how everything they eat and drink affects their baby, but others may have no medical restrictions towards drinking green tea, for example. The decision to either drink or not drink green tea should be made only after accounting for our current health status, existent health issues and individual response to the components in the tea. This being said, there are several things you should know about green tea. First of all, why is green tea good for you? 1) Reduces cancer risks. According to research, green tea contains catechins and theaflavins, two constituents with potent anticancer properties (Tea and health: studies in humans). Catechins have been shown to possess free radical-scavenging properties and prevent extensive oxidative damage that may lead to cancerous formations. Lung, bladder, colon, esophagus and skin cancer are several forms against which the infusion is believed to protect. The catechin epigallocatechin-3-O-gallate in particular has been shown to increase the efficacy of an anticancer medicine called Herceptin, used for stomach cancer treatment, according to the Institute of Bioengineering and Nanotechnology, Singapore, and Beth Israel Deaconess Medical Center and Harvard Medical School in the US. This compound in green tea basically helps the medicine better target cancer cells and increases its lifespan in the circulatory system. 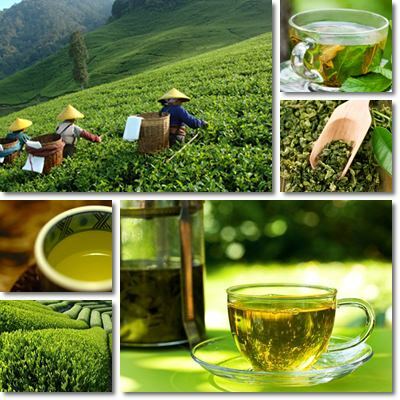 In addition to this, green tea is rich in polyphenols, natural compounds with strong antioxidant activity. Research suggests that a diet rich in antioxidants may contribute to better health and offer protection against chronic illnesses such as cancer. 2) Anti-aging properties. Antioxidants in green tea are known to reduce oxidative stress brought upon by free radicals, reactive oxygen molecules. By scavenging free radicals and reducing the stress they put on cells and DNA, foods and beverages rich in antioxidants such as green tea are believed to contribute to better health, including skin health. 3) Promotes weight loss. One of the first and most famous properties of green tea is that of promoting weight loss. According to various studies, green tea and green tea extract in particular can boost metabolism and stimulate the body to burn fats, encouraging weight loss. These health effects are believed to result from the stimulating effects of caffeine in the herb. 4) Antimicrobial properties. Green tea boasts antimicrobial activity and can protect the liver against hepatitis caused by a viral infection. Moreover, the antioxidant polyphenols in the infused leaves are believed to exert a protective action against alcohol damage to the liver. However, the best resolution for a healthy liver is to eat and drink right, alcohol excluded. Green tea is also believed to protect against dental cavities similar to conventional dental care products as a result of its antimicrobial properties. However, more research is needed on the subject. 5) Anti-inflammatory action. Compounds in green tea exert an anti-inflammatory effect and, as a result, the infusion is used to reduce inflammation at the level of the stomach and intestines. Moreover, due to its refreshing or stimulating effect, green tea is often drank to treat nausea, vomiting, headaches etc. 7) Promotes cardiovascular health. Green tea is believed to contribute to cardiovascular health because of its antioxidant content which maintains healthy blood vessels. Because of its stimulating effects, green tea is also consumed in view of raising low blood pressure. Moreover, preliminary studies suggest it helps clean cholesterol buildup on blood vessel walls, reduce bad cholesterol levels and atherosclerosis risks (Green tea intake lowers fasting serum total and LDL cholesterol in adults: a meta-analysis of 14 randomized controlled trials). However, green tea should be consumed with moderation as it can elicit moderate to severe side effects in some categories that are more sensitive to the effects of caffeine in particular. 1) Insomnia and disturbed sleep. The caffeine in green tea can alter normal sleep patterns in certain individuals and cause insomnia. The lack of rest will, in turn, lead to fatigue, irritability and anxiety or magnify existing anxiety symptoms. 2) Allergic reactions. Particularly sensitive individuals may experience an allergic reaction to certain components of green tea. Children, expecting mothers and new mothers should avoid green tea as its health effects on newborns and children have not been researched. 3) Fast heartbeats, palpitations, extrasystoles, arrhythmia, tremors. All of these symptoms are side effects of often excessive caffeine consumption and may appear following green tea consumption. 4) High blood pressure. Green tea can cause hypertension as a result of its caffeine content, especially when consumed in great amounts. Also, the infusion interacts with hypertension medication. 5) Increase of medication action. According to research, green tea interacts with anticoagulant medication such as warfarin, potentiating its effect and increasing the risk of bleeding. Extracts or infusions may also increase the effectiveness of antibiotics as a result of their antimicrobial action. 6) Medication interactions. Green tea may interacts with depression or anxiety medication as a result of its caffeine content which stimulates alertness, counteracting the sedative properties of certain medicines. 7) Ulcer sufferers and people suffering from emotional problems. Despite its anti-inflammatory properties, green tea may also irritate the stomach mucosa as a result of its caffeine content. For this reason it is not recommended for gastritits or ulcer sufferers. Learn more about what foods to eat and to avoid for gastritis. People suffering from emotional problems (anxiety, depression, mood swings) are advised to avoid green tea while on medication because of potential interactions between the tea and the medication. Overall, green tea is a great option for keeping healthy, unless you are either allergic to it or on certain medication that could interact with compounds in the tea (examples may include: anticoagulants, hypertension medication, antidepressants etc). Except for medication interactions and allergic reactions, which may be severe in nature, the infusion does not elicit other serious side effects. However, if you feel worse after having green tea, then maybe you should look for other medicinal herbs to enjoy. At the same time, green tea is believed to be a better choice than white or black tea and other varieties. Although they are all made from the leaves and leaf buds of the same tree species, green tea is said to be the least processed and oxidized (unfermented), hence its health benefits. Unfortunately, it can be a bit bitter. Why is green tea so bitter? Because you steep it too long. One minute is enough time to infuse green tea leaves and get a mildly bitter flavor as well as some wonderful health benefits. The hotter the water you steep it in and the longer you leave the leaves there, the more bitter the tea will become.